Better Buy: Wal-Mart Stores, Inc. vs. Lowe's Companies, Inc.
Pitting the two successful national retailers against each other as stock investments. Wal-Mart (NYSE:WMT) and Lowe's (NYSE:LOW) have two of the most stable retailing businesses in the stock market. In fact, both companies have raised their dividend payout for over 20 consecutive years. Wal-Mart's chief grocery rival, Kroger (NYSE:KR), can't claim the same stellar track record. Neither can Lowe's main competition, Home Depot (NYSE:HD). Today, I'm taking a closer look at these two dividend aristocrats to see which one would make a better buy for investors right now. Sales growth is for the past complete fiscal year and excludes fuel sales and exchange rate changes. Data sources: Company financial filings and S&P Global Market Intelligence. Wal-Mart's operating trends are improving with respect to both its past stumbles and industry rivals. The retailing titan just posted its sixth consecutive quarter of positive comparable-store sales. Comps improved by 1.4% last quarter, which bested Target's (NYSE:TGT) 1% decline and marked an acceleration over the prior quarter's 0.8% boost. The company even managed to fight to a near draw against Kroger, which has been poaching away market share from Wal-Mart's grocery business for over a decade. Lowe's, meanwhile, is enjoying higher absolute sales gains but is also struggling against the competition. The home improvement retailer's latest 2% comps figure was far from the 5% that Home Depot managed. At the same time, Lowe's continues to lag its bigger rival in the key metrics of profitability and cash flow. Overall then, Wal-Mart wins this round since it is executing better against peers. Income investors will find more reasons to prefer Wal-Mart over Lowe's today. Not only do shares come with a higher dividend yield (2.8% vs. 1.9%), but the retailing giant has demonstrated a stronger commitment to sending cash back to its shareholders. Wal-Mart spent over $6 billion on dividends last year, compared to $4 billion on stock repurchases. Lowe's, in contrast, dedicated the vast majority of its cash returns to stock buybacks. Wal-Mart also delivers a higher percentage of earnings to investors as dividends. While Lowe's aims to return just 35% of profits each year, Wal-Mart's payout ratio is climbing toward 50%. WMT PS Ratio (TTM) data by YCharts. Round two goes to the king of retail. A bright outlook for their industry has Lowe's executives feeling confident right now. After all, the home improvement market has strong fundamentals, including housing formation and home prices, that point to years of continued above-average growth. Lowe's executives frequently cite that "favorable macroeconomic backdrop" as a key reason that customer traffic keeps trending higher. Home Depot's management agrees, and the CEO recently told investors, "We continue to see positive signs in the housing data which we believe serve as a tailwind for our business." Wal-Mart, in contrast, is fighting to post even nominal growth in a sluggish industry that executives of Target and other retailers have called "challenging." That weakness is especially true on the grocery side of the business, where price deflation is tripping up most market participants. Kroger, for example, just posted its worst expansion pace in years and projected soft growth for the rest of the 2016 and into 2017. Give this round to Lowe's. The stock valuations of these two retailers appear to reflect their different growth and profit profiles, as Lowe's is more expensive on both a price-to-sales and price-to-earnings basis. Still, that's a justifiable premium, in my view, given the retailer's faster, more profitable growth. There's clearly room for more gains, too, given how quickly Home Depot is expanding right now. Lowe's key challenge will be to close the gap with its key rival, which is an admittedly tough feat. 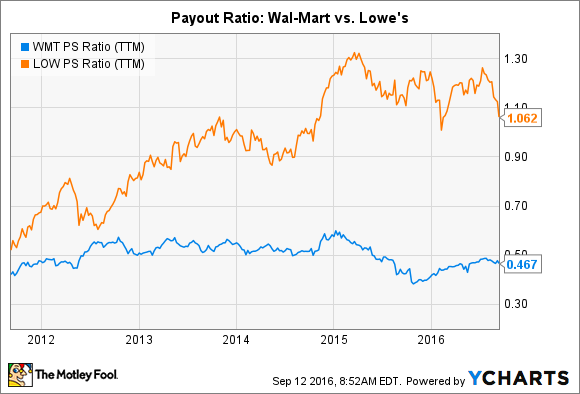 Lowe's might even be preferable over Wal-Mart for income investors. Yes, its payout is lower right now. However, that is understandable, given that it needs cash for major growth initiatives like boosting its store base. And ultimately, steady housing market gains could help produce faster dividend growth over the coming decade.